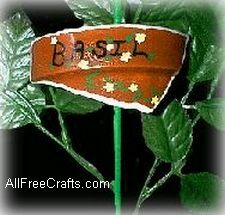 Use broken clay pots to make beautiful painted plant markers. 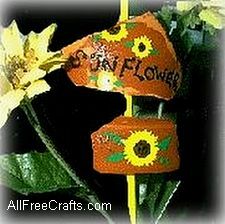 Practical and pretty, these plant pokes will help keep track of the seeds you have planted – and they cost next to nothing to make! didn’t that feel good? You should end up with some great shards to use for plant markers. Pick one or two pieces that you think will work well. Start painting the pieces – there are no rules, so can paint a rim, like the one we have around the basil marker, or you can paint the shard entirely in one background color. Draw on some simple vines and little flowers, just like you did in grade school. Use one of the paint colors to paint the dowels. After the paint has dried, glue each pot piece to a one foot length of dowel, leaving just a little of the dowel showing over the top. You may want to prop the dowel so it stays nice and straight. Lastly, if you plan to put the plant marker outside, seal the dowel and the marker with an exterior sealer. For indoor use, you can get by with a water based craft sealer in matte or gloss.